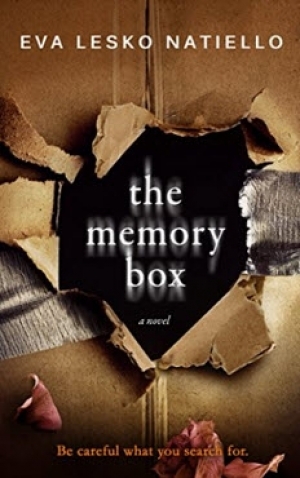 Earlier this week, Jessica Collins recommended “The Memory Box,” Eva Lesko Natiello’s debut novel. Jessica’s description sounded intriguing enough that the psychological suspense thriller jumped to the top of my list, and Natiello’s compelling metaphors hooked me from the jump. I began reading late on Thursday evening, in retrospect probably a bad idea, given that I needed to get some sleep. After staying up way past my bedtime, I devoted every available moment today to finishing it. Yes, it was that gripping. The novel is narrated by Caroline Thompson, a 35-year old mother of two young girls. She has a loving husband, a house in the suburbs, and a memory problem: She can’t seem to recall crucial events from her past. A Google search, which she conducts because it’s the done thing among her mom crowd, exposes hidden truths that keep piling up and lead to a finale I did not see coming. That’s as much as you want to know about the plot at this point. Suffice it to say that twists and turns come by the bucketful. I will tell you this: the novel is epically creepy. I found it even creepier than Gillian Flynn’s “Gone Girl.” After I read the last word, I had to sit back for a moment, take a deep breath, and think of cute and comforting things, like kittens, baby hedgehogs, and chocolate bunnies to stop the chills running through me. Part of this is due to the above-mentioned unexpected ending. Natiello leaves it just open-ended enough to allow the reader’s imagination to go on whirring after the story on the page ends but without sacrificing the need to make sense of what happens along the way. If you like psychological thrillers, loads of surprises, and powerful writing, this one should meet your needs.